Town councillors have approved plans for a multi-million pound shopping and leisure development in the heart of Rochdale. Phase one of the scheme will be in excess of 18,500m², and will bring around 24 shops, restaurants and a new cinema into the town centre. Next, Reel Cinemas and M&S have already signed up to the development, which will also have 340 parking spaces. The scheme, which is being led by Genr8, in partnership with Kajima and Rochdale Borough Council, is a key part of a £250M regeneration package which has transformed Rochdale town centre since 2011. The extension of the Metrolink to the heart of the town centre, the re-opening of the River Roch, the opening of a sixth form college and the new transport interchange are all part of the £250M programme, which the latest scheme will complete. 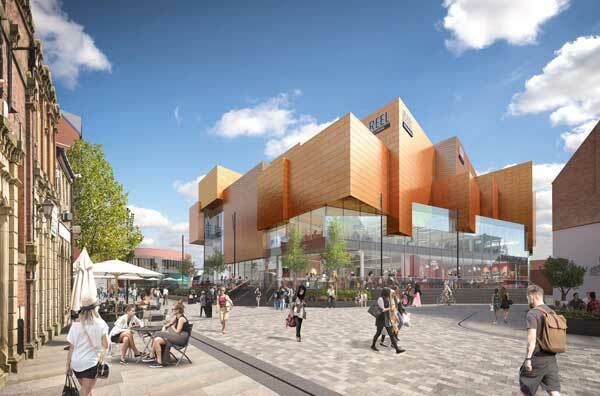 Cllr Richard Farnell, leader of Rochdale Borough Council, said: “This is yet more progress for this important development which will bring high street names that are not currently represented in Rochdale, as well as thriving restaurants and a cinema, which will create a fantastic destination for our residents and visitors. Work is expected to start on the site this autumn.